The HOW2s are the step-by-step visual guides to evidence-based teaching techniques, and the other features of the app all revolve around them to keep interactions focussed and productive. Each HOW2 has three types of visual guide for you to view. A question inspectors often ask leaders is ‘How do you know the impact of your strategy?’ The new Ofsted handbook is going to use the same demands for rational thinking from teachers and their pedagogic choices, and the ‘How it helps’ panel is designed to aid you in giving solid answers. Several Skills Exchange features can be accessed directly from the HOW2 pages. You can assign your own status and easily get in touch with colleagues who are working on the same technique. Set yourself a goal or suggest a specific action to others related to the HOW2 you’re viewing by giving a friendly ‘Nudge’. 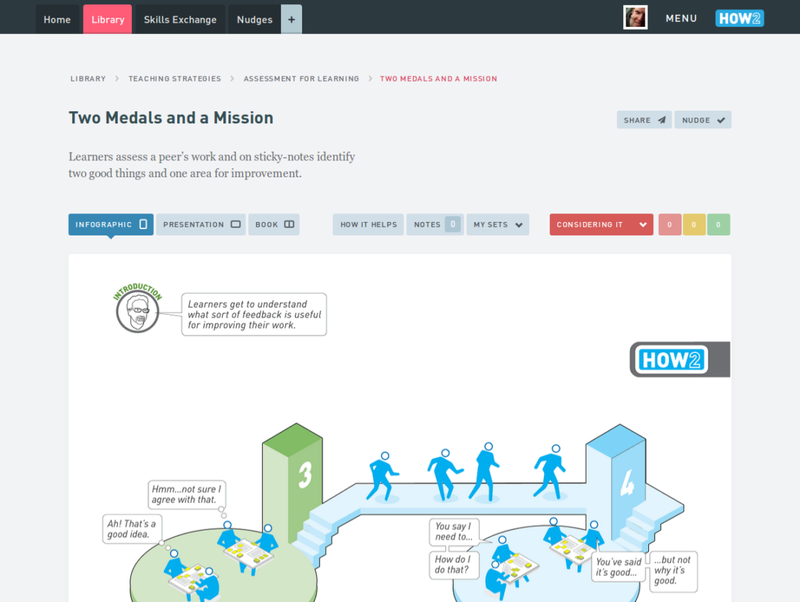 Use the Skills Exchange to keep track of your learning and to find colleagues to work with. You can assign statuses to HOW2s throughout the app, wherever you see a 'Set Your Status' button.